Just like my post last week with a list of Christmas book ideas for 9-12 year-old girls, this week’s list of books shouldn’t be restricted to only boys. While all the protagonists in these books are male, there are strong female secondary characters. It’s always good to read about the other gender, too! The rogues by Lian Tanner – Tanner’s The Keepers series was hugely popular, so I’m looking forward to reading this new fantasy series. The story opens with Duckling and her grandfather, Lord Rump, who has promised he only needs to do one more scheme, just enough to earn some more money. But he needs a disposable boy. ‘Strong. Not too bright … no fond aunties to make a fuss if something happens to him.’ Doesn’t that phrase – disposable boy – make you want to read on? The graveyard book by Neil Gaiman – this author needs no introduction, and really, whatever he turns his hand to becomes gold. This book won the Carnegie Medal in 2010. It’s an interesting idea – a baby boy survives a horrible attack in his home. His parents and older sister were killed, and the baby survives because he climbed out of his cot and toddled out the door, up the street and ended up in the graveyard. A lovely dead couple who never had children of their own adopt him, and the boy (Nobody Owens or Bod) is given Freedom of the Graveyard – a living boy raised by the dead. This book is suitable for 11 years plus. Guinness World Records 2018 – this book is a fabulous non-fiction book for those kids who love learning and remembering facts about anything and everything! It’s perfect for lazy summer afternoons, flicking through random pages. 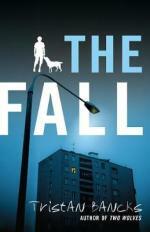 The fall by Tristan Bancks – I loved Bancks’ earlier book, Two Wolves, and enjoyed reading this one, published this year. The main character is almost thirteen-year-old Sam, who witnesses a body fall from the apartment above his dad’s. His dad is a crime reporter. Someone knows Sam has seen the incident, and now Sam must protect himself. Bancks writes gritty but sensitive stories, especially with regard to how fathers are viewed by their sons. This one is for older kids, even thirteen or fourteen-year-olds. Have sword, will travel by Garth Nix and Sean Williams – this Australian duo have written other books before but this is the first book about Odo, Eleanor and the enchanted, talking sword, Biter. Odo, reluctantly, and Eleanor, excitedly, are on a quest to find out why the river near their village has dried up. With dragons and knightly combats, this is a page-turning adventurous read. I particularly like how Odo’s reluctance to be a knight contrasts with Eleanor’s burning desire to become a knight, like her mother. 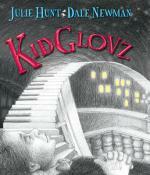 KidGlovz by Julie Hunt and Dale Newman – this is an amazing graphic book, published in Australia two years ago. It’s a fabulous collaboration between Hunt’s words and Newman’s illustrations about a young piano virtuoso, KidGlovz, who is worked almost to death by his so-called uncle. His talent is so extraordinary that people pay exorbitant amounts to see him perform. KidGlovz’s world turns upside down when he meets Shoestring, a young thief. It’s an original story, told in harmony with words and illustrations. While most readers would enjoy this story, it might be extra useful for reluctant readers. A boy called Christmas by Matt Haig – Mr 8 and I borrowed this one from the library for me to read to him, and I suspect Miss 11 will enjoy reading it, too. Nikolas is a woodcutter’s son, who lives in the middle of Finland. They are extremely poor, but Nikolas is content to listen to his dad’s stories about elves, play with the turnip-doll his deceased mother made for him and believe in magic a little bit. I loved the philosophy of the elves that Nikolas meets on his adventure. Elves never say the word impossible for ‘an impossibility is just a possibility you don’t understand yet’. 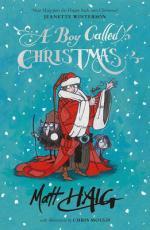 This book has so much heart – it could become a lovely family classic to read every Christmas. Mr 8 really likes the humour. Harry Potter and the Prisoner of Azkaban by J.K. Rowling (illustrated book) – I’m sure most households have at least one Harry Potter book but these illustrated books are lovely. They’re hardback, with wonderful illustrations by Jim Kay. Even if you have older readers who have read all the Harry Potter books, the gift of an illustrated version to a younger reader might make him or her feel just a little special. The first three Harry Potter books are available as illustrated books – the publishers release one a year. 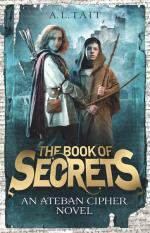 The book of secrets, an Ateban cipher book by A. L. Tait – Gabe has never left the monastery where he was left as a baby. But when a dying monk entrusts him with an illuminated book that Gabe can’t read, he must leave the monastery to protect the book. This has a classic children’s book quest feel about it. Gabe meets four amazing girls in his travels so this is a book for both boys and girls. I’m looking forward to reading the next one in the series, The Book of Answers, to be published next year. Nevermoor by Jessica Townsend – I mentioned this book in last week’s post but I’m adding it in here again because I don’t want the boys to miss out! I can’t speak with any authority about it because my copy arrived yesterday and I haven’t read a single page. But it would be remiss of me not to mention it because there has been so much publicity about it. It is said to be the closest thing to Harry Potter! Karen… I know I know… I am over the age of 12 year olds but being a lover of all the Harry Potter books, I could not resist the urge to get my hands on a copy of Nevermoor… may I say it is a great book… enjoying it as much as Harry Potter. It’s not the same but it’s a great read even for this oldie🙂. I’m looking forward to discussing it with you, Ingrid. And you’re never too old to read children’s books – it actually means you’re very wise! Great list, Karen. I have heard so much about Nevermore too. I’m sure someone on my Christmas list will receive it. Lucky recipient, Terri, to find ‘Nevermoor’ in their stocking!